Thanks to popular movies such as Madagascar and Happy Feet, penguins have become one of the most popular exhibits at both zoos and aquariums all over the world. 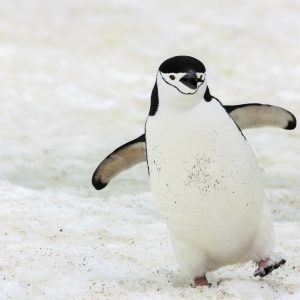 In honor of Penguin Awareness Day, check out some fun facts about one of our favorite flightless friends. Penguins are primarily found in the southern hemisphere. Although they are mostly associated with Antarctica, they can also be found in parts of South America, South Africa, Australia, and New Zealand. Galapagos penguins actually live in a tropical environment near the equator. Penguins are commonly recognized for their stylish ‘tuxedo appearance’, but this coloring actually serves a survival purpose. The black of their back disguises them from above using the murky water while their white bellies hide them from predators below. While most birds have hallowed bones enabling flight, penguins have very heavy bones which make them quick swimmers. Some species of penguins can swim up to 22 MPH. Penguins can drink salt water and not get sick. They have a small gland just above their eye that filters the salt from their bloodstream. However, they will usually seek out fresh water for drinking purposes and only consume salt water if that’s their only option or inadvertently while swimming. They expel the salt from their bodies by sneezing.